VIFC- Cooking With Dairy – Food. Boom. Have I mentioned that as well as our foodie nights the lovely Victoria Inn also hosts Cheese Club once a month? Yes, that’s where select individuals ascend to the private room at the back and eat a load of cheese. And talk about cheese. Then eat a bit more cheese. I couldn’t wait to get on board with cheese club, but it’s on a Monday and I invariably forget to go which is my own shameful cross to bear. Anyway so last month the draw for the February meeting was an ingredient- Dairy. This lead me to suspect that I might get in on some of the cheesy goodness previously lost out on due to my sporadiac appearance for cheese club. I wasn’t wrong, and it did seem easy to go straight for the cheese in our savoury dishes. What was surprising was how many other options came to mind after we had all cooked, sat and devoured. I struggled to come up with ideas for my starter I have to say but in retrospect I was just being brain lazy. 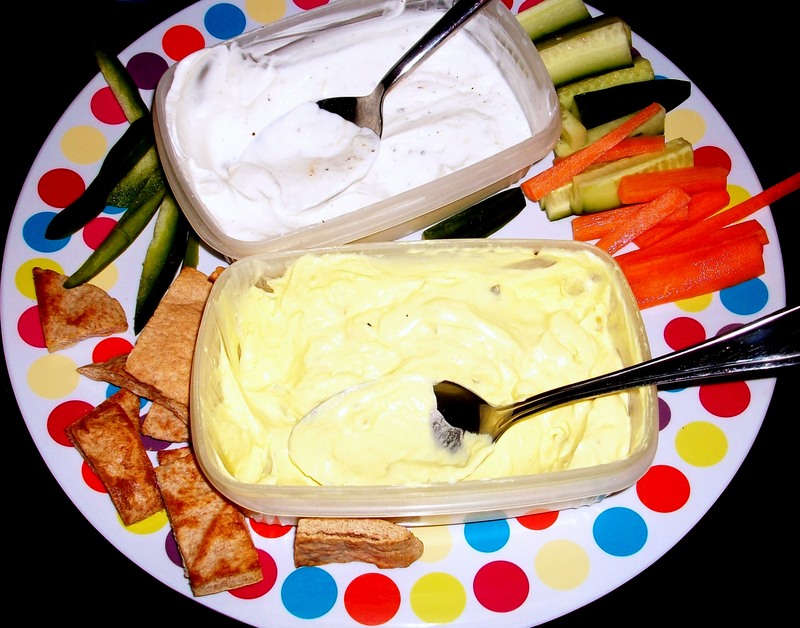 And also somewhat nostalgic as I initially decided to make an old favourite from The Mothership- her cream cheese and sandwich spread dip. Oh My Goodness. Amazing stuff, possibly some of my earliest dinner party involvement helping to stir this up to complete the ubiquitous Crisps and Dips. This was in the 80s when this was still a cool and suave thing to do before falling totally out of fashion then coming back as kitsch and/or slob out TV night food. Sadly I didn’t get to share this piquant tub of cheesey delight with my fellow foodies as the Sandwich Spread drought in the local area was so severe as to lead me to believe that Heinz had discontinued it, however I have since been corrected that it can still be found in Asda. Maybe we will come back to this another day. I did however bang out a passable mustardy cheesey dip and a highly pleasing goats cheese dip which I will summarise for you at the end of this post. Crudité! Recipe at the end of this post. The mustardy dip was a little pokey but I enjoyed it and the lemony goats cheese although runny was very pleasing, may well have made a good salad dressing. Serving platter model’s own. Prawn Mornay. I love you Sheena. 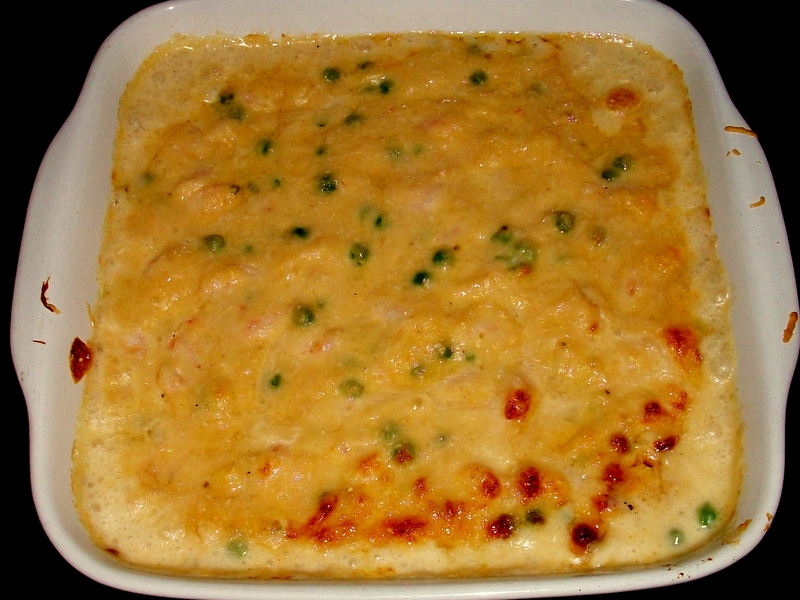 Thick, rich bechamel with paremesan and another (which I’m going to say gruyere but may be mistaken) cheese with prawns and peas to make it healthy. Ahem. Absolutely beautiful. 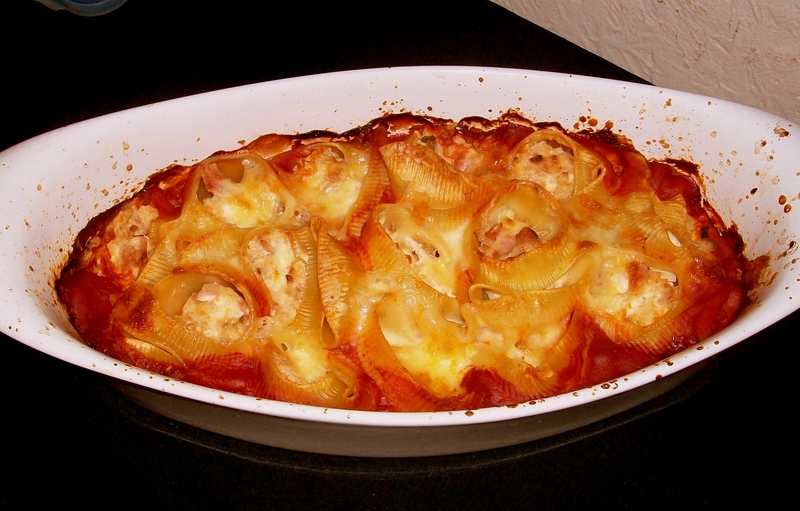 Cheesy bacon and pasta shells in a tomatoey sauce from Charlotte. I would say better than similar dishes you pay eight quid for in your chain Italian restaurant of choice and end up tasting only durum and garlic. Really nicely done. Extra points for using mahoosive shells. Tom, I love you more than I love Sheena. 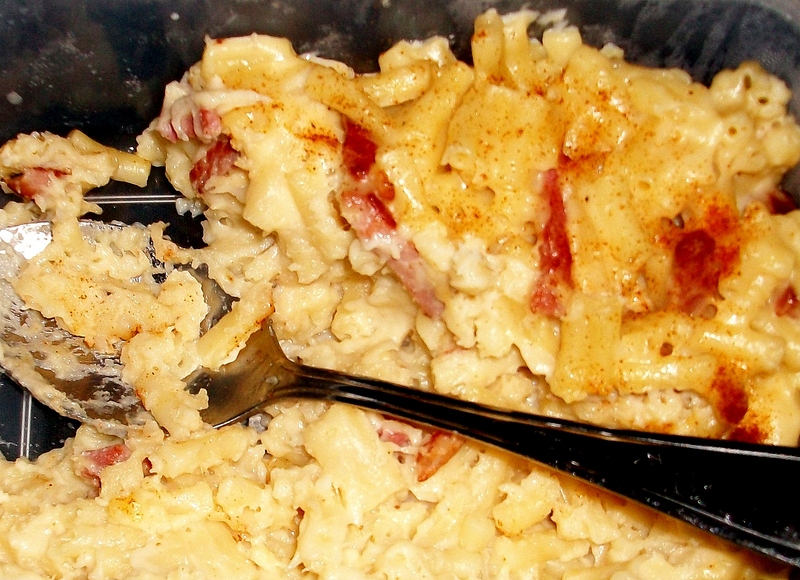 Mac n cheese n bacon, hooray! Tom broke an (apprently) established food club rule by healthy-ing up this dish using rice flour, skinny milk and half fat cheddar but I applaud him in this it was SO delicious. I’m a sucker for macaroni cheese anyway to the extent that I couldn’t be British and politely decline his offer of me taking the leftovers home for my lunch. It was as good cold the next day from my desk. Bravo, my favourite for this month. 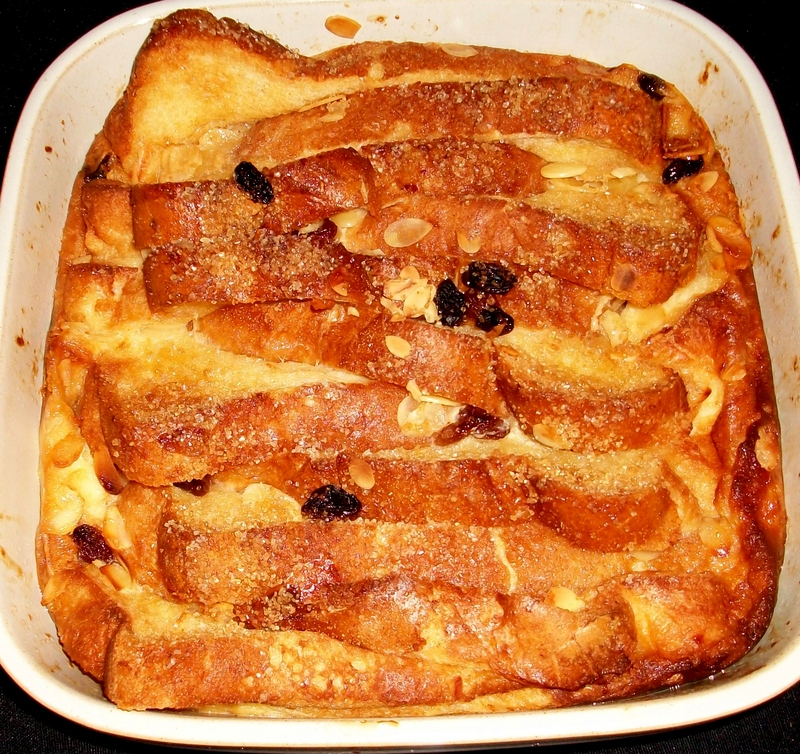 Bread and Butter Pudding by Matt, who yes scored another dessert draw by totally legitimate means. Hmm. 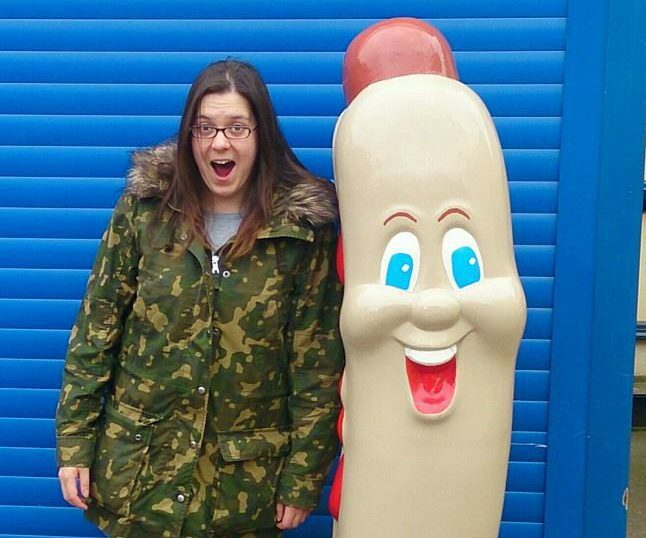 This was well recieved by everyone who doesn’t have an inherent biological phobia of soggy bread. Extra points for double dairy usage. Creme Bruleé, Proffessor Stu, perfectly executed. We think this is the third outing of a creme brulee at food club, the archives are to be checked to verify this. 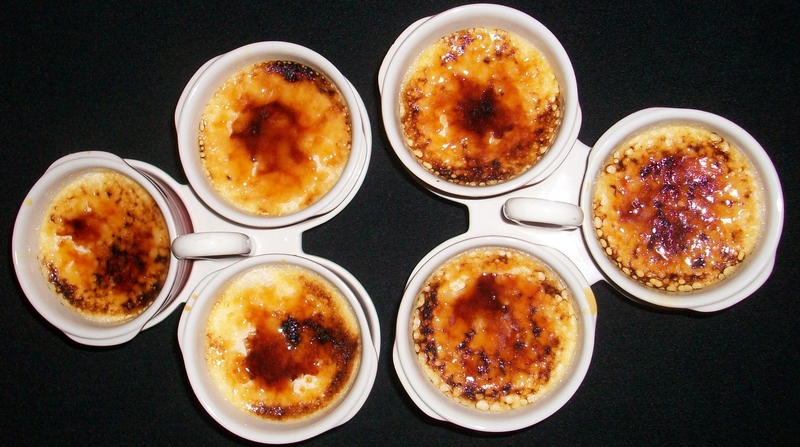 I wonder if maybe we should have a creme brulee cook off…..
We gather next in March to share our findings on food of the fifties and a new added category to aid our creativity- all ingredients to be British sourced. As promised here follows two very easy dips to be made at home when you feel a bit retro or don’t want to eat a proper dinner infront of Poldark. Serve with sliced carrots, cucumber and peppers to counteract the massive fat content! I also like pitta chips a la Boomboom made by roughly chopping wholemeal pittas, drizzling with rapeseed oil and a good shake of maldon sea salt and freshly milled black pepper then baked in a medium oven until the edges start to brown. Also good seasoned with paprika. Combine one tub of philadelphia (or cream cheese of your choice) with three tablespoons natural yoghurt and two finely chopped gherkins and 1-3 teaspoons of hot english mustard, depending on how pokey you can take it. Take 250g of a soft goats cheese and the juice of 1 lemon and mush down with a fork, adding natural yoghurt until you can beat this into a soft dippy consistency. Blanket the top with fresh black pepper. I think this might work with feta too but don’t quote me on that just yet. NextA sad customer’s plea to the commercial smallholders.